I have dedicated a major portion of my career to studying the life and work of Rafael Guastavino. 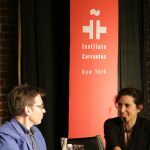 Recently I was honored to play a part of two screenings of El Architecto De Nueva York, the award-winning documentary in which I appeared with Kent Diebolt and John Ochsendorf as well as our Spanish colleagues Camilla Miletto, Arturo Zaragosa and Fernando Vegas. In the film we guided viewers through iconic examples of his work in New York City such as Grand Central Terminal, the Guastavino Oyster Bar, Ellis Island and more. This documentary won a Gold Dolphin at the 2016 Cannes Festival and a New York Festival World’s Best TV & Films section Biographies. The director was Eva Vizcarra. 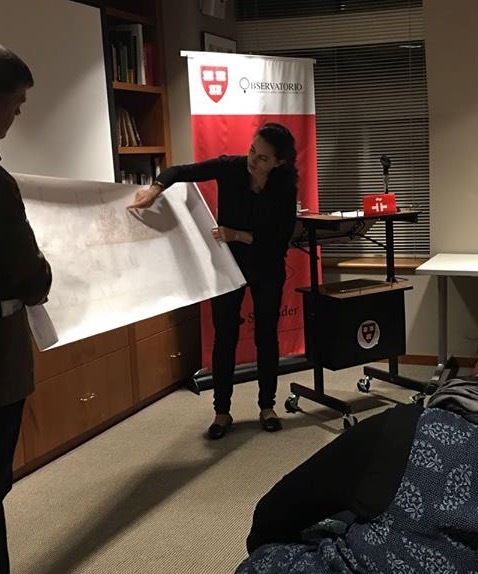 Here I am after the Harvard screening showing a timeline we developed that follows the projects and main events in the Guastavinos’ lives. 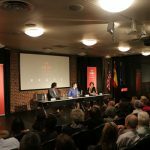 On October 23, I moderated a round table following the documentary screening at the Instituto Cervantes NYC. Jaume Soler, an acoustician with more than 20 years of experience designing theatres and concert halls around the world. He studied telecommunications engineering at the Polytechnic University of Catalonia and he is currently an associate principal at the engineering firm Arup. Jaume’s first contact with the work of Rafael Guastavino was in a small town near Barcelona, while studying the acoustics of La Massa theatre in Vilassar de Dalt about 18 years ago. However, it was not until he moved to New York, in 2001, that he grasped the breadth and impact of Guastavino’s work. Jaume has worked and conducted acoustical surveys of several Guastavino projects since then. Miguel Quismondo received his degree in architecture from the Polytechnic School in Madrid and developed his career in the United Sates. Over the past decade Miguel has worked for Olnick Spanu on the design, construction and management of Casa Mia, the Olnick Spanu Art Program, and the Magazzino Italian Art. He holds Master’s degrees in Real Estate Development from Columbia University and Construction Management from NYU. Miguel’s work has been issued in la Biennale di Venezia, Architectural Record, A+U, Casabella, ABC, El País and El Mundo among other publications. We usually talk about Guastavino as an individual but in fact there were two: Rafael Guastavino Moreno & Rafael Guastavino Expósito (RGM and RGE). Who were these two men and what is a Guastavino vault? Referred to as “Palaces for the People”, Guastavino vaults involve a technique known as timbrel vaulting: utilizing layers of interlocking small, flat tiles, plaster and mortar. This technique has been described as inexpensive, fireproof, light, fast to build, having almost infinite aesthetic possibilities, and was installed by the Guastavinos in more than 1000 buildings in 11 countries. The two materials used in Guastavino vaults (Rundorf and Akustolit) significantly impacteded fields such as theatric and other performing arts. “Whispering gallery” sound effects were not designed intentionally but are an artifact of architectural design. William Jordy was the first to include the Guastavinos in a History of Architecture publication in 1972. This is unfair for two men that are considered two of the most important architects/constructors. Considering their amazing contribution in different fields they are not as known as they should be. Surprisingly, we still don’t study the Guastavinos and their innovations in architectural and engineering academic curricula. RGM often compared music to architecture, saying that both need not only the creator or the artist but equal importantly the craftmanship of the hands of who is actually building or playing the music. That kind of craftsmanship today would be difficult and expensive. Each one of us chose a favorite Guastavino building and explained the election. Mine was the demolished Penn Station. Based on my research and historic photos, that building is one of my favorite for many reasons. As the architect, educator and critic Vincent Scully compared the demolished Penn Station to the current one: One entered the city like a god. One scuttles in now like a rat. 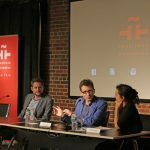 I let the audience know that they were about to see the only documentary ever filmed about the Guastavinos, two Spanish architects/constructors responsible for designing and building iconic spaces in more than 1000 buildings in the world. Of these, there are around 156 Guastavino buildings in Commonwealth of Massachusetts. RGM registered the patent of what he called “cohesive construction” as a fireproof system. The timbrel vault was inspired in the traditional Spanish construction system of the bóveda tabicada o catalana. He used traditional architecture as an inspiration for innovation. In total, the Guastavinos held 24 US Patents. Inexpensive: no form, fast to build. The main dome of Saint John the Divine (the largest cathedral in the Western Hemisphere) was built in just 3 months. Almost infinite aesthetic possibilities. Fusion of industry, art and craft. They were beautiful. USA: 1066 / Canada: 21 / Cuba, Holland, India, Mexico, Panama, Spain, Trinidad, UK: 26. In New York City: 363; in Massachusetts : 156. Their peak year of production was 1909 with 39 buildings in construction. In Manhattan approximately 12% have been completely demolished. During the early 1960’s the Metropolitan Museum of Art’s consulting engineers did not fully understand the structural behavior of the Guastavino vaults in wings E and H, so they decided to demolish them and replace them with a steel beam girder system. New aesthetic styles started to reject curvilinear surfaces in favor of the flat planes. Post-war changes in construction technology also began focusing on more industrial or manufactured, rather than hand-made approaches. Rise of engineering: the company used to serve both as a structural engineer and constructor, but new codes forced the company to work under other structural engineers, many who didn’t understand the system and forced the company to over-build the structures. Rise of reinforced concrete and thin shells: in 1913 German engineers built a concrete dome spanning 200’ (61 m) which, for the first time in 2000 years surpassed the Pantheon. In 1934 the Hayden planetarium in NYC was built with a concrete dome spanning 81’ (24m) and 3 inches thick (7.5cm). The American Concrete Institute promoted concrete as less expensive. In 1954 MIT organized an event on concrete shells and the Guastavino Company sent a representative to find out the price per square foot: $3. At that moment, due to rising labor cost, a Guastavino vault cost $7 square foot. RGE sold the company in 1950 and died in 1962. The last project is Cathedral of St. Philip in Atlanta, GA, 1961. 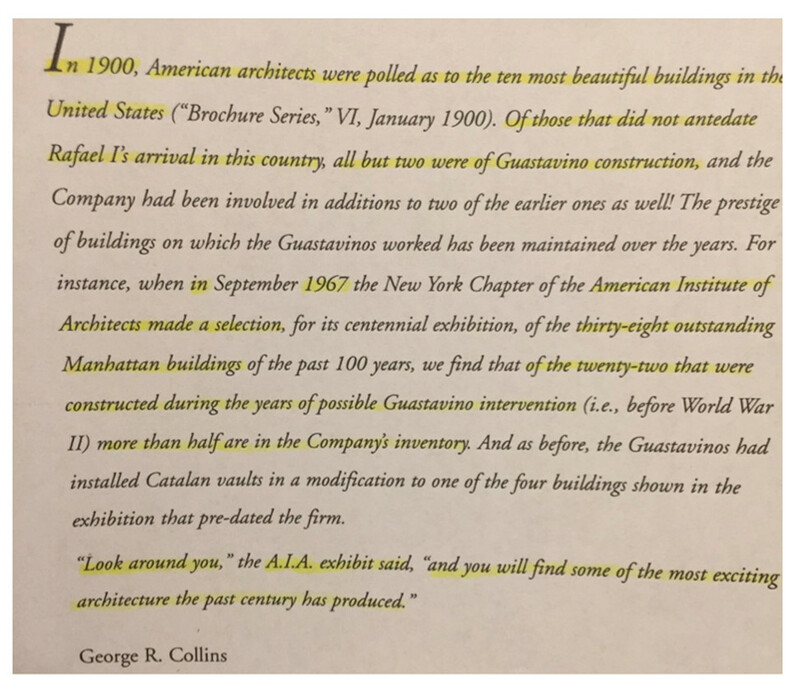 Something to think about: How is it possible that the Guastavino Fireproof Construction Company could supervise so many ongoing construction sites simultaneously?